while bob bradley was trying his best to make me look stupid last week (and just barely failing), good old michael owen seems to be taking my advice. owen... playing for the other reds!? all of the major news outlets out of england are reporting this morning that owen is currently at old trafford taking an “extensive” medical, ahead of a proposed switch from newcastle to manchester united. up until this point, all we had heard about him landing back in the EPL were rumors of hull city and stoke trying to land the striker. everton, the club owen supported as a child, was also thought to be mulling over signing him. but now manchester united seem to have won the race to his signature? really?!?! to say the least, i’m shocked that sir alex made the move. 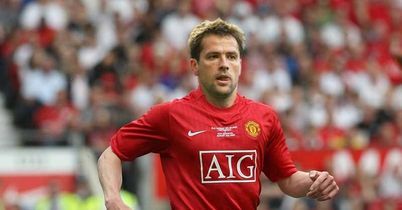 you know that all of united’s transfer plans are falling through if they’re turning to michael owen to replace tevez and ronaldo. with both of united’s primary targets having already made a move to real (karim benzema) or declaring they will only leave their current club for real (franck ribery), i guess fergueson has just thrown up his hands up. “well, i guess owen will do.” the risk is minimal though, as he was a free transfer since his contract was up at newcastle and they’re not wrapping a lot of salary around him. however, an obvious miracle for miracle move for owen has to feel like a stab in the heart to the kop. even after michael left liverpool for madrid, then returned to england for newcastle, the liverpool fans never turned on him. but a move to their bitter rivals, manchester united? i’m sure there are tears on mereyside, and many fans have finally turned on their old hero. but michael, i’m happy for you. you’ve made your deserved return to the EPL. now prove your worth, and prove us all wrong. but if this means my fiancée is going to start rooting for manchester united, then i’ll join the angry kop fans and hate you a little bit more.